An Iron Condor is a dual Credit Spread option strategy created from four positions: a Long and Short Put Option and a Long and Short Call Option. Most Iron Condor trades are Long Iron Condors constructed by selling two vertical credit Spreads: a Bull Put Spread and a Bear Call Spread. Iron Condors are non-directional strategies that profit when the Underlying price remains in a range defined by the two Short strikes for both call and put sides. They have defined risk (i.e. a maximum loss) and a maximum theoretical profit also. Iron Condor is most profitable when the Underlying asset or commodity expires between the two call and put Short strike prices. Iron Condors favour a high Volatility market when opened which subsequently declines to lower Volatility towards Expiration, i.e. Vega reduces over the lifetime of the trade. Only one side of the Iron Condor can be a losing trade. This, combined with their ability to profit irrespective of whether the investor is right or wrong about market direction makes them popular with Options investors, in addition to their relative simplicity compared with other more sophisticated strategies. Although the risk of Iron Condors is defined, it is important to be aware that if one side (i.e. one of the Bull put or Bear credit Spreads) is allowed to go into the money and remain there until Expiration, the loss incurred will still usually exceed the credit received from both sides. Some Options traders prefer to enter one side of an Iron Condor and then add the other side later, however, there are others who argue that one should treat the Iron Condor as a complete position and enter both sides simultaneously. A further variation is the unbalanced Iron Condor. This is where there is an uneven number of contracts on either the Put or Call side so the position is weighted towards one side of the market. This would normally be contemplated if the trader has a view about the direction of the market, but wants to hedge their position somewhat (or they believe any expected move may not be a particularly significant and they can still take in credit from both sides). In addition to Long Iron Condors, it is possible to create a Short Iron Condor where the Long and Short option positions are reversed so the Short side is furthest away from the money (i.e. a call and put Debit Spread). These are less commonly used and when the term 'Iron Condor' is used, it generally refers to the Long variant. The trader keeps the $100 credit received. This is the total amount of profit available. The trader incurs a loss of $1000 which is offset by the credit received of $100 to reduce the liability to (-$900). This is the total amount the trader can lose. A TastyTrade.com video explaining how Iron Condor strategies work. Steady Options guide to trading Iron Condors. Covers the key areas such as deciding how close to the money spreads should be placed as well as the potential risk to capital of allowing one side of an Iron Condor to go in the money. Basic guide to the Iron Condor options strategy. Should You Flock To Iron Condors? Investopedia article describing Iron Condors and their benefits. Investopedia article explaining some basic Iron Condor hedging methods. InvestingWithOptions.com guide on methods to adjust ICs to avoid heavy losses. This article describes both rolling and hedging strategies that can be applied before and during a trade. SteadyOptions.com article advising options traders to manage their expectations about the scale of returns possible with Iron Condor options strategies. Article with a checklist for entering Iron Condors, including recommendations about selling volatility when the VIX (Volatility Index) exceeds certain thresholds and managing risks. 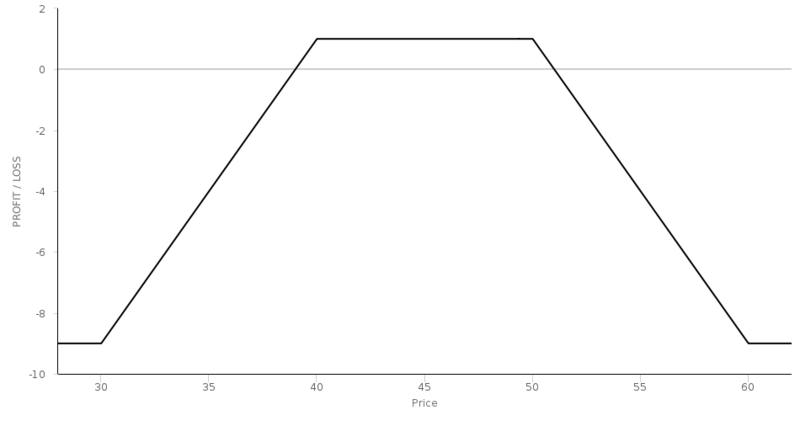 Description of an unbalanced Iron Condor combined with a put debit spread by Dan Harvey which he terms the "The Weirdor" or "Jeep Trade" due to the payoff diagram's graphical resemblance to the top of a jeep. Gavin McMaster describes nine different methods to adjust Iron Condors both offensively (i.e. to increase profits) and defensively (to avoid or mitigate losses). Kerry Given outlines an Iron Condor adjustment strategy using a long put or call in the following month to hedge a position if one side is getting closer to going in the money. Kevin Matras from Zacks Investment News describes Iron Condor options trading strategies.